Ashley Duda A receipt to pickle White Wall-nuts. 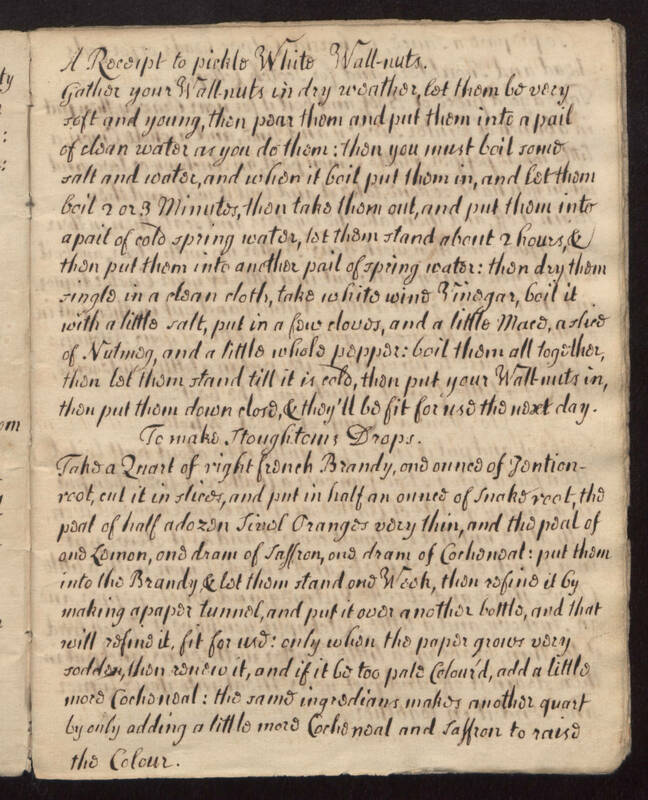 Gather your Wall-nuts in dry weather, let them be very soft and young, then pear them and put them into a pail of clean water as you do them: then you must boil some salt and water, and when it boil put them in, and let them boil 2 or 4 minutes, then take them out, and put the into a pail of cold spring water, let them stand about 2 hours & then put them into another pail of spring water: then dry them single in a clean cloth, take white wine vinegar, boil it with a little salt, put in a few cloves, and a little Mace, a slice of Nutmeg, and a little whole pepper: boil them all together then let them stand till it is cold, then put your wall-nuts in, then put them down close, & they'll be fit for use the next day. To make Stoughton's Drops Take a quart of right french brandy, and ounce of gentian-root, cut it in slices, and put in half an ounce of snakeroot, the peel of half a dozen seville oranges very thin, and the peel of and lemon, and dram of saffron, one dram of cochineal: put them into the brandy, & let them stand one week, then refine it by making a paper tunnel, sandpit it over another bottle, and that will refine it, fit for use: only when the paper grows very sodden, then [unreadable] it, and if it be too pale colour'd, add a little more cochineal: the same ingredients makes another quart by only adding a little more cochineal and saffron to raise the colour.